"Little Miss Muffin and all of her friends are ready to Pop n’ Flip into your hearts! 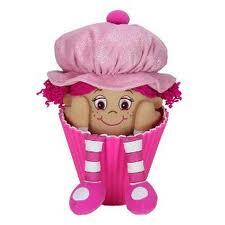 Hiding snugly inside her own muffin cup, pull Little Miss Muffin’s top, pop the muffin n’flip inside to see your very own Little Miss Muffin doll! 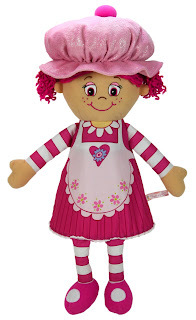 Dressed in adorable aprons ready for baking fun, Little Miss Muffins are soft and cuddly with cheerful faces. Sure to delight children ages 3 and up." "There are ten Little Miss Muffin dolls, each with their own scent: Miss Chip, Blueberry, Pumpkin, Cherry, Plum, Sugar, Cinnamon, Vanilla and Coconut. Little Miss Muffin is available in two sizes, 9 inch and a jumbo 19 inch size. They are available for purchase currently at Toys “R” US stores, ToysRUs.com, Walmart stores, and coming soon to Target stores. You can see the entire Little Miss Muffin doll line on ToysRUs.com." What we thought: 6-year-old A has really enjoyed playing with her Little Miss Muffin doll! She loves that the doll actually smells like blueberries:) She can easily be changed from doll to muffin and makes a great friend. The doll is super cute and would be a fantastic gift for any doll-loving kiddo. ABCD Diaries gives Little Miss Muffin an A+!